Well there's a couple of days left of 2013 and I won't make progress around New Year's eve. But today I fitted the back braces and glued the back on Patsy's piccolo, and gave the resos a few glaze coats. In a few days I'll fit the hardware on them! A great big thank you to all of my readers, regulars and occasional. 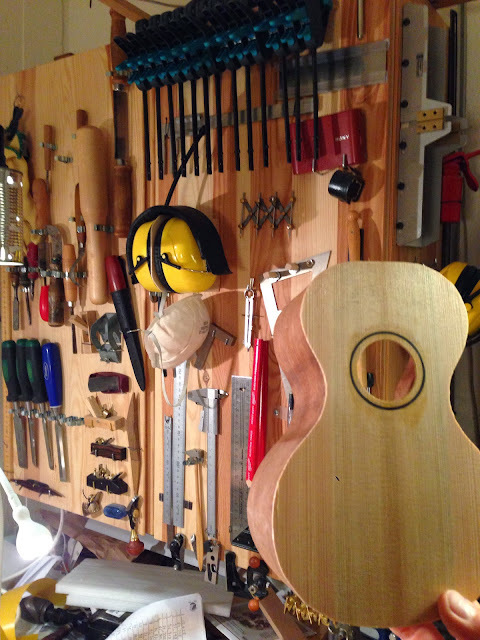 2013 wasn't the most productive of years, fewer ukes and not as many blog posts. I've started making the posts a bit longer though, a new app makes it easier to fit more images in each. And the ukes I've shipped have been better and more consistent. I have become better at french polishing and better at using hand tools such as planes and my big rip saw. I've gathered more material, some reclaimed historic wood and some koa and other species. Before I show you today's pics I must say that I miss my dear friend Brian Newman who passed away much too soon this summer. I will miss him and his wonderfully mean comments on this blog. 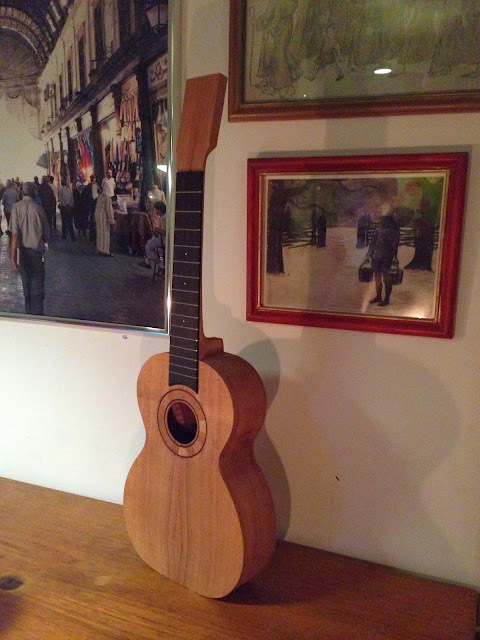 This spring I will repair a tenor guitar that he gave me. Okay, on to this morning's going-ons; I put the kerfed lining strips in Patsy's uke last night, so today I planed them down to be level with the sides. Oh and the neck's in place, must've missed that particular Kodak moment. And here are the resos. I wet-sanded them yesterday to level the shellac and now they await the final "glaze coats". This is a challenge. I've yet to finish the french polishing process without resorting to a bit of buffing with a rubbing compound but this time I aim for a by the book finish. Merry christmas and I actually wish all of you a great new year! 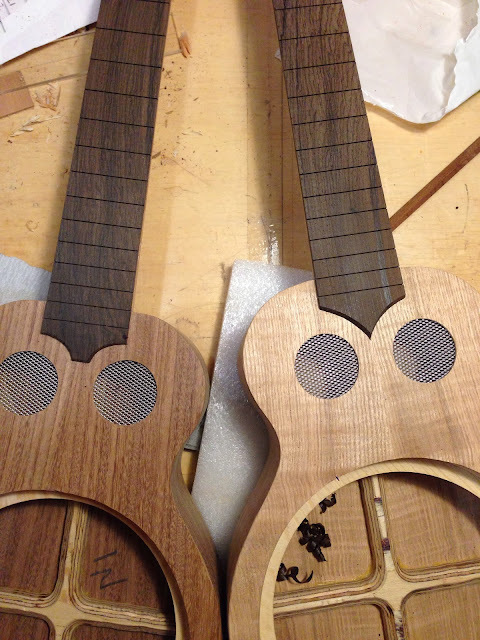 A few Argapa ukes have been bound. 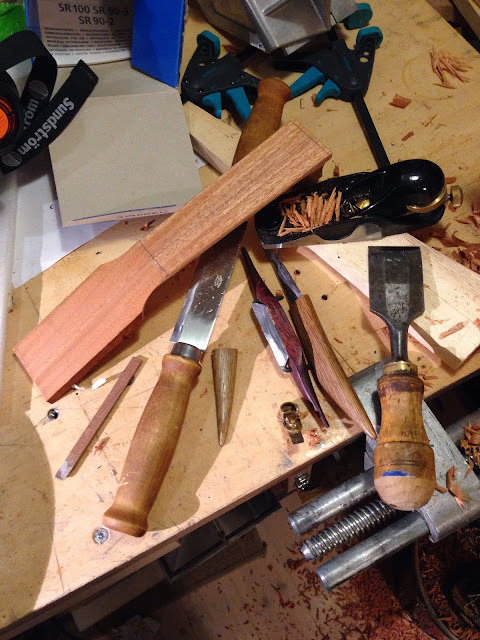 I think binding is needed around a softwood top such as spruce or cedar, but avoid using it as a decorative element on for example koa, cherry or mahogany instruments. This is only because I think it's so damn difficult. So this afternoon as I was getting ready to fit the neck on Patsy's piccolo I had this feeling that I'd forgotten something. 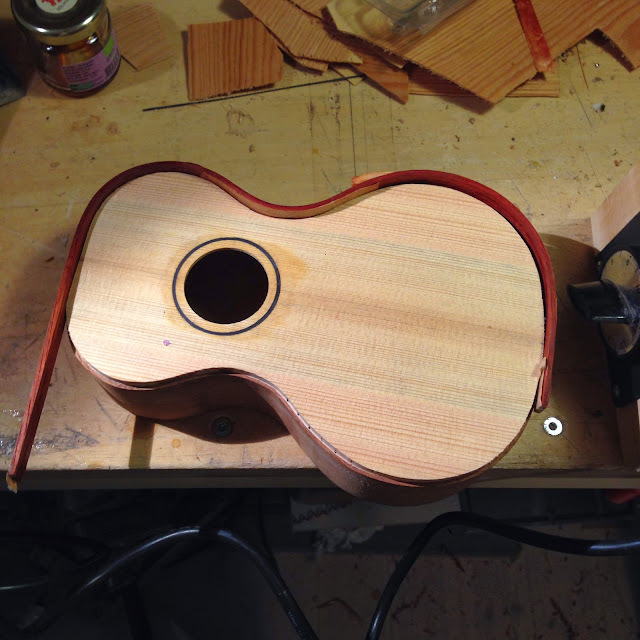 Of course, I promised myself to bind the spruce top. Out with the router and a couple of wooden strips I had kicking around. I use the tiny Stewmac router adapter for archtop instruments. It's fiddly andhard to use but a more dedicated router setup hasn't been needed this far. And here's why I post this (apart from vanity). To bend the strips more easily I taped them together with brown artist's tape so they'd get support from each other and be bent in the same way, to start with. And I found that the tape helped the strips from cracking! Here's the strips. The tape is on the outside of the bouts and the inside of the waist. I'm not sure if it was purely mechanical support or if the cellulose glue on the tape wicked into the wood, but in any case the tape kept the moisture in the strips and they didn't crack. I'm so happy. After both were bent to fit one side I sliced the tape apart and adjusted one to fit the other side. 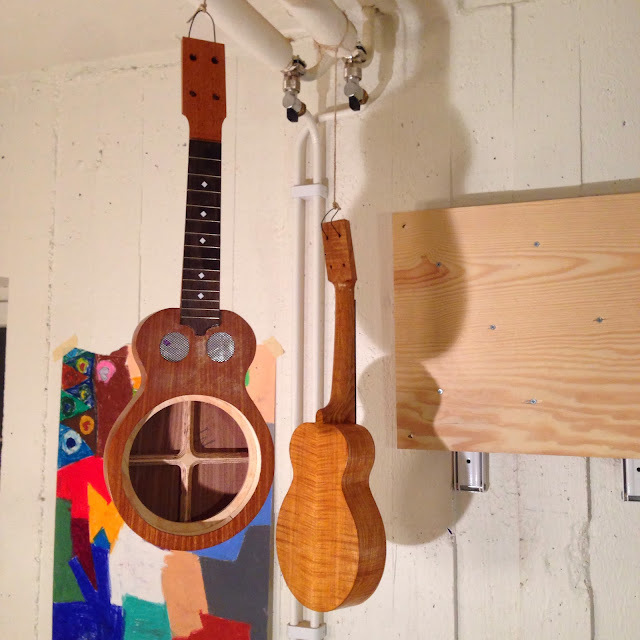 This involved some pretty hard work, the uke wasn't totally symmetrical. 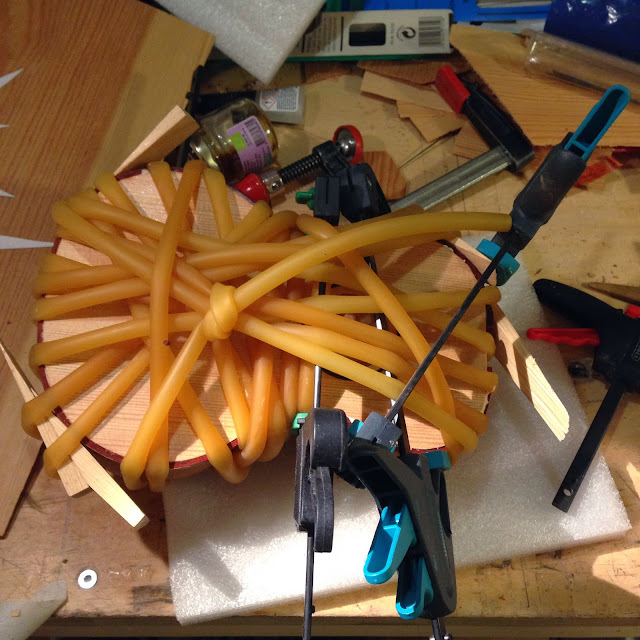 Then I glued them with regular Titebond glue. Superglue is so messy and I didn't want to attach bits of finger. The back isn't on yet so I stuffed the body with blocks of wood and wedges so it wouldn't collapse. So far it looks good but I won't get my hopes to high up - I have had binding looking so bad after glueing I had to route it off and start over. Once more, I'll rant about neck carving. It is (I think) my favourite stage in a build. I've gotten a bit too fast for my own liking though - it's over almost as soon as it's begun. But doing it slowly paid off. The mahogany had some rather difficult reversing grain that I could control by angling the contour plane carefully to match it. And look at these pics of the result. It damn well shines! It is totally untouched by any abrasive tools or sand paper. I'll tell you my secret at the bottom of the post, after the pics. The secret of my success tonight, then. Sharp tools. 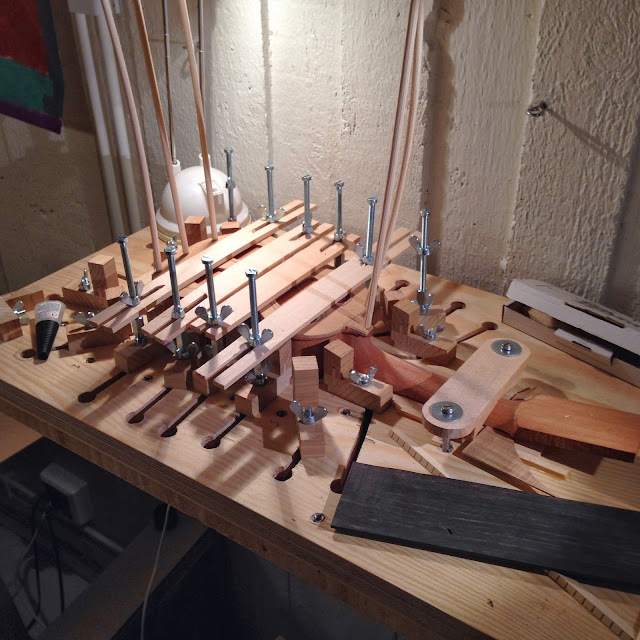 I slotted the fretboards and got ready to taper the sides. Holding them finger tight on the necks I marked with a pencil along the edges of the neck. Then I placed a steel straightedge at the marked line and scored a deep line with a marking knife. 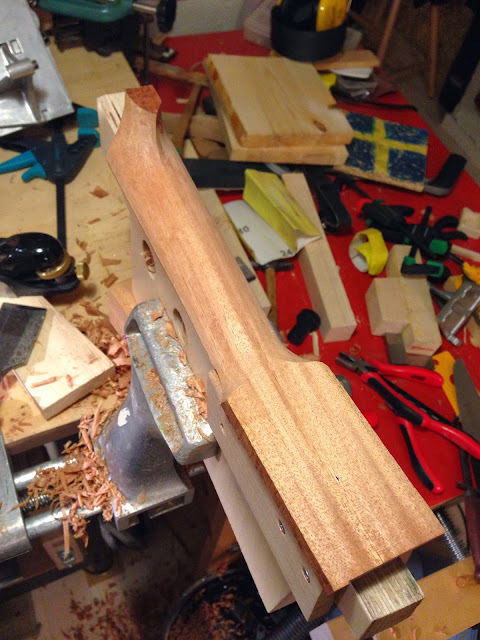 I want the fretboard edge to be ridiculously straight - chances are the edges of the neck are not at this stage. 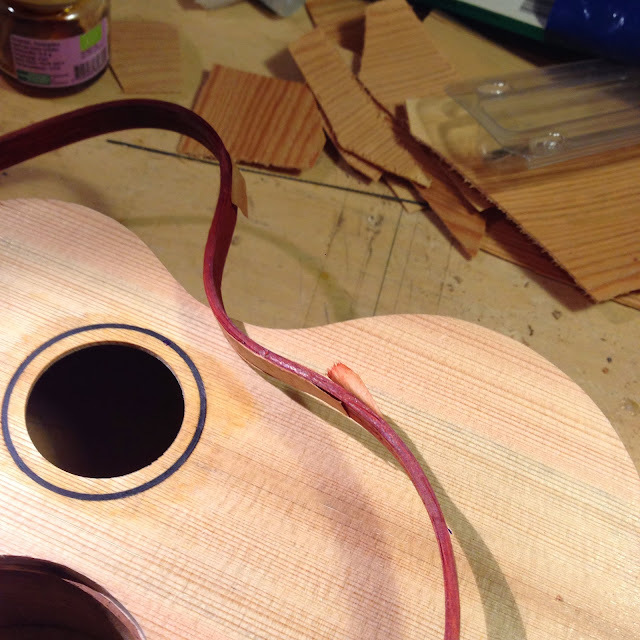 But I can fix that by sneaking up against the fretboard with a scraper when it's glued. Before, I would've sliced off a bit on the small bandsaw before planing. But now I have a couple of planes that'll make short work of bringing down the width. First up is a Stanley Handyman. It's a simpler version of the 4 1/2, the mouth is too wide and it lacks the adjustment screw for the frog. I've put a camber on the iron and it works sort of like a small jack plane. 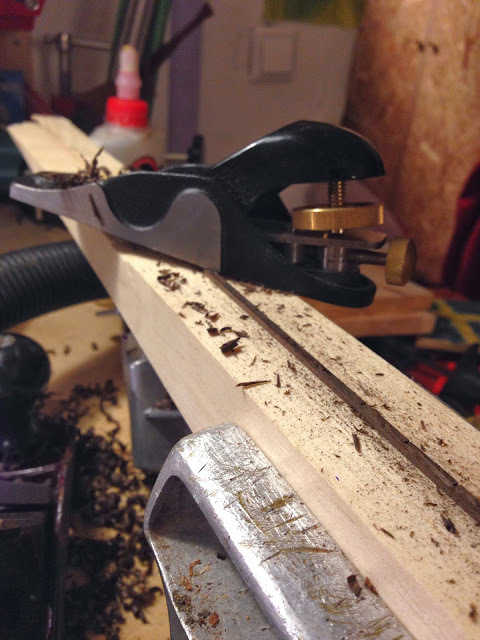 This plane hogs off most of the wood but is prone to tear the grain a bit. Next one is a proper 4 1/2, with the tighter mouth and the blade ground and set for smoothing. With this plane I work closer to the line and make sure it's dead straight. That's easy since the tool itself is a great reference. Finally I made a few passes with the small apron plane to get right into the scored line. And all this in ten minutes, both fretboards. I couldn't have done it faster with machines or sandpaper, and this way I only had a few handfuls of curly shavings to clean up instead of nasty dust. Continuing the low tech, stubbornly backwards way of doing stuff, I carved the ends of each board with my sloyd knife. Templates, spindle sanders and router - pfff. If you've read enough of my rants on here, you know that I really don't like finish sanding. It's messy, noisy (if you use machines), tedious, and above all it simply doesn't give me a good enough result. But what to do with scratched and uneven wood if finish sanding is out of the question? You scrape. Or more precisely, you get scrapers and sharpening stones, you watch videos online and you buy a burnisher. Then you try, fail, start over and practice. I'm getting better at lapping, sharpening and burnishing scrapers and as I do my results improve. So this morning I trimmed the overhanging bits on these resos, then I sanded a bit with the Abranet system (a handheld sanding block with a dust collecting hose) to get drops of glue and bumps I missed with the chisel and contour plane. Then I scraped them with these. A Bahco card scraper, a goose neck scraper, and a Carruth scraper from Stewmac. In the pic you can also see the burnisher I bought from... was it Stewmac or Lee Valley? Can't remember. I did have some regrets after buying it because I wasn't pleased with what it did, but that was me using it in a wrong way. Now when I compare the edge it gives with an edge I get with a traditional burnisher I find that it's actually better. And it's easier to use. But what of the results then. I don't expect it to be perfectly clear in this picture, but it's silky smooth and perfectly even. 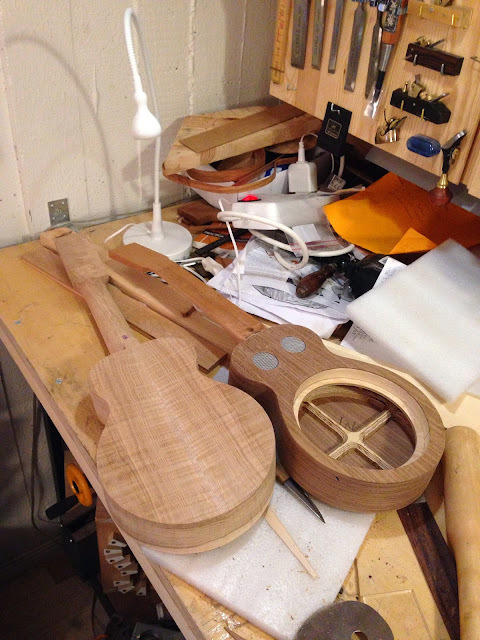 All traces from the thickness drum sander are gone (and they're usually around at delivery time for each Argapa uke). 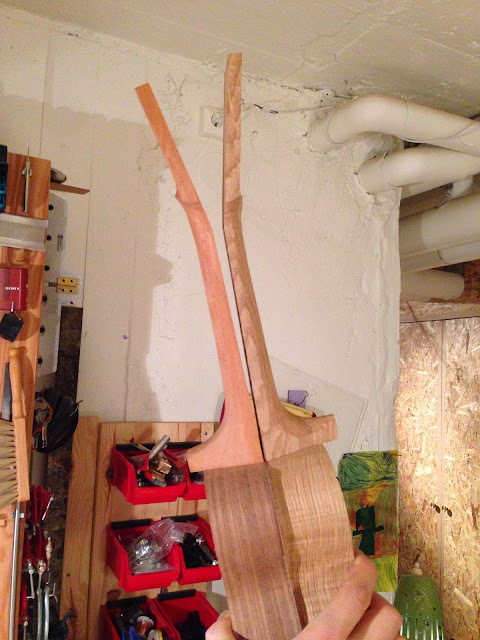 The species are English walnut to the right, and some highly figured Swedish ash to the left. Yes, it's the same as Jukka's and Aya's wedding uke. I started tidying the shop to get some space for building a christmas gift to myself and my wife. But with half finished projects littering the place it's too damn easy to pick something up and continue building. Tonight my eyes fell upon the resos. The necks already had holes for the barrel bolts so how hard could it be just to drill for screws and tie everything together? The first picture shows the fifth dry run. I had forgotten the level of engineering skills I have to fake to build these! How on earth do I choose, and then set, the proper neck angle? I put a cone in and a cover plate on, then did some dodgy calculations. 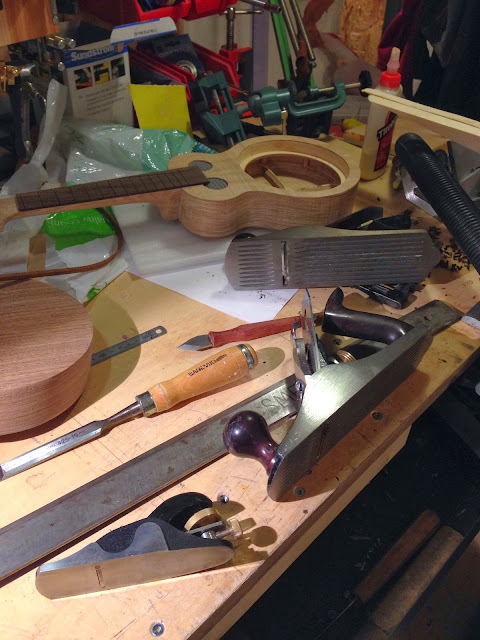 On my acoustics it's easy - I just bend the neck a bit when I glue the back on. The back always covers the heel and keeps the angle in place. The miniscule difference between the front and back edge on the upper bout is sort of masked by gouge marks and general asymmetries. But, back to the resos and tonights frustrations. It seems that an angle of two degrees is about right. I planed and pared away at the heels. The mahogany neck for the walnut reso was a bit brittle in the end grain so after shaping I let some CA glue soak in at the middle. I don't want that barrel bolt to come rushing out when I tighten the screw. The ash neck was easier, heavy and solid as a really solid thing. Here's me trimming the overhanging bits of soundboard. 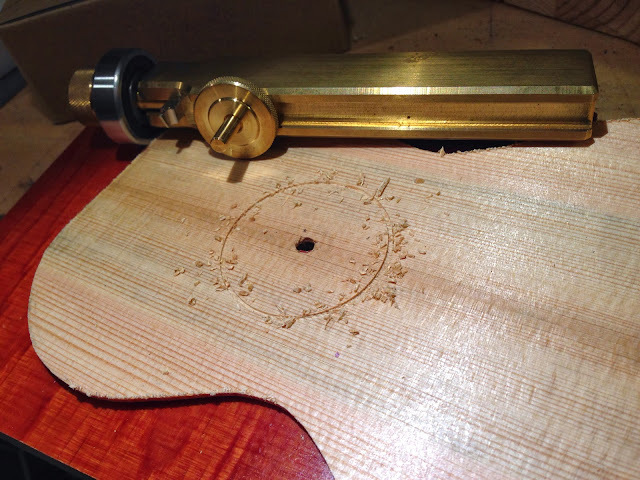 Others prefer a flush cut bit in a router but I'm, ahem, past that. The truth is I don't dare to use a router, and they create un-manageable amounts of noise and dust. Not an option in an apartment workshop. Plus they're no fun to sharpen, chisels on the orher hand... Wait, what? 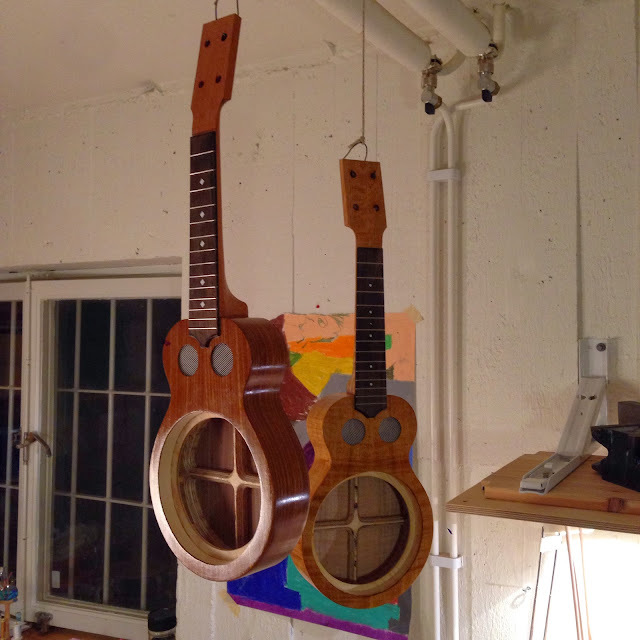 This blog is about ukes? Sheesh. You people. And here's the box so far (what's important is that you can get a glimpse of the Argapa tool shrine - never mind the pesky uke). I have gained a bit of confidence, and an excellent tool. So I'm not as terrified of rosettes anymore. The cutter comes from the talented tool maker Micheal Connor in Australia. I can't say enough good things about it, or about Micheal. 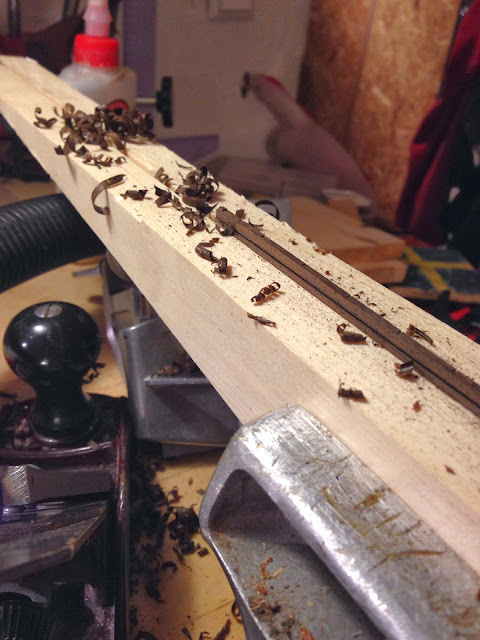 I scored two lines, flipping the cutter between them, then routed out the wood with a chisel shaped blade. Pics of the rosette later. 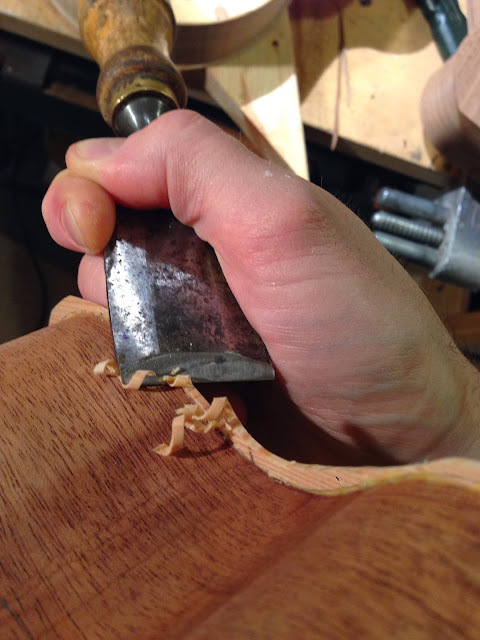 When I bend my one piece sides by hand I often get the curvature a bit aggressive at the neck end. 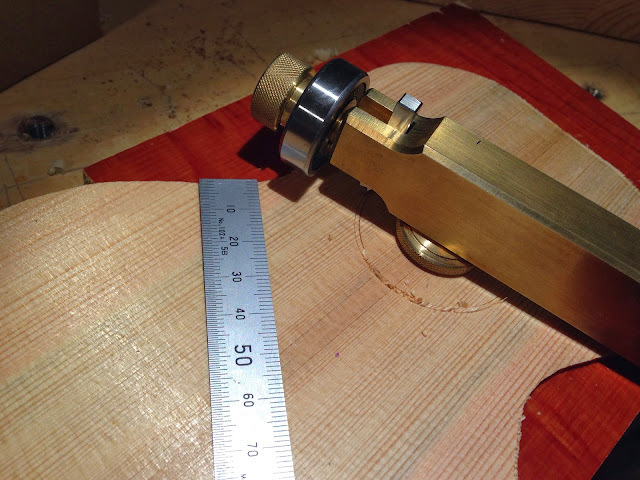 The ends should ideally have a straight couple of centimeters but typically the preceding radius goes on. 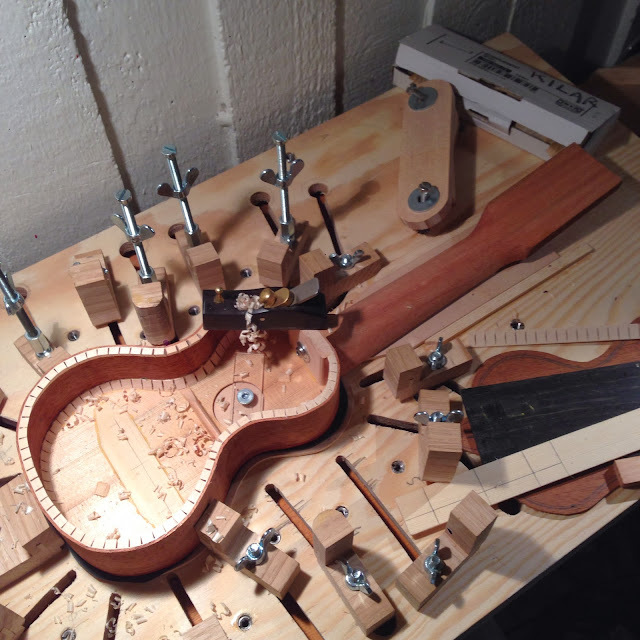 This makes it difficult to glue the neck block. If I shape the mating side of the block to meet the mis-shaped ends it works but then I don't get the flat spot on the outside. I aim for flat since the 12th fret is at the joint. And sanding the outside risks going through the sides. So, did you get all that? There will be questions afterwards. Straightening the ends on the hot pipe is hard because I don't get any leverage. So I sandwiched the sides between some flat scrap pieces, steel flashing and my heat blanket. After five minutes everything looked wonderfully machine made. The koa concert is soon done. 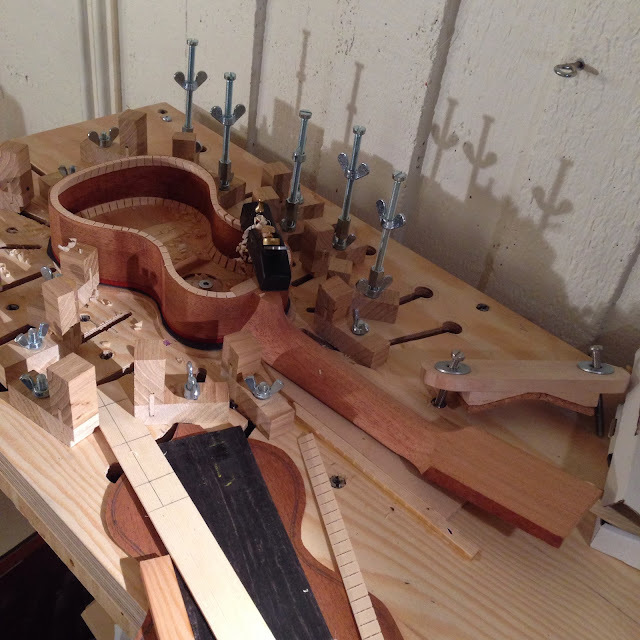 I woke up quite early today and started rubbing out the finish, then I fitted the Peghed tuners, and then it was sort of just the bridge left. Now I'm in a real hurry! 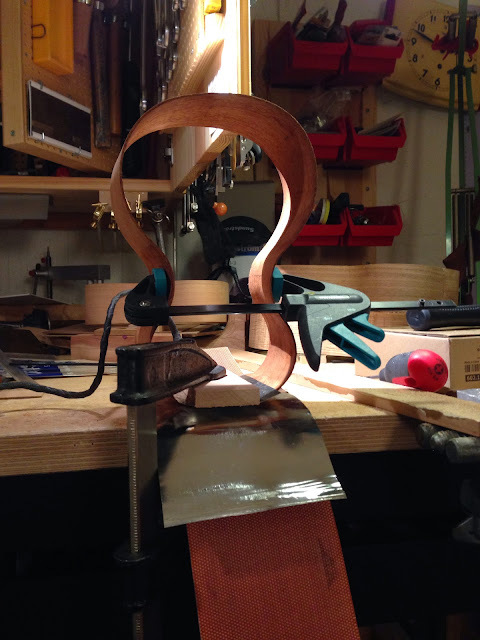 After the kids had gone to bed I whipped out the shellac and muneca, the bending iron, and Robert's baritone. 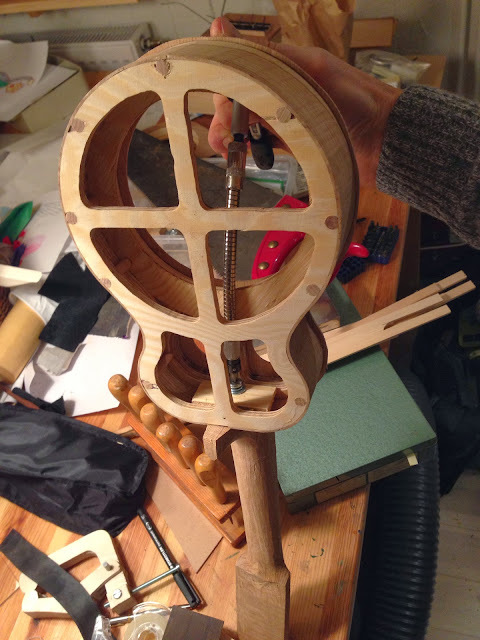 So look at the pics, in the first you can see the concert half way through the french polishing process. 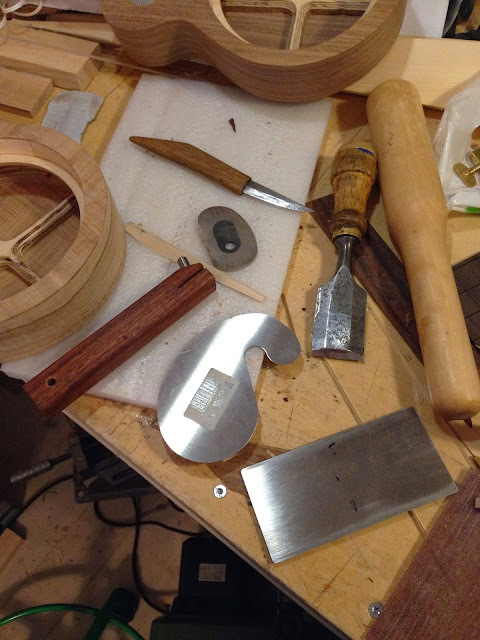 To the right in the photo you see Patsy's mahogany sides bent and put into the piccolo mould. Second pic shows the baritone which had a loose brace end. I was going to sand the old glue away with a piece of sandpaper in the gap, but the whole brace fell out. That was so much better because I could then plane a new surface and glue it in again. 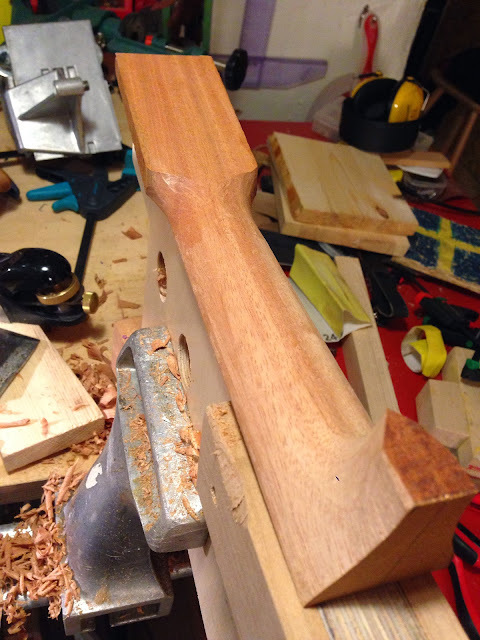 I think I'll make a cherry bridge to match the headstock overlay. 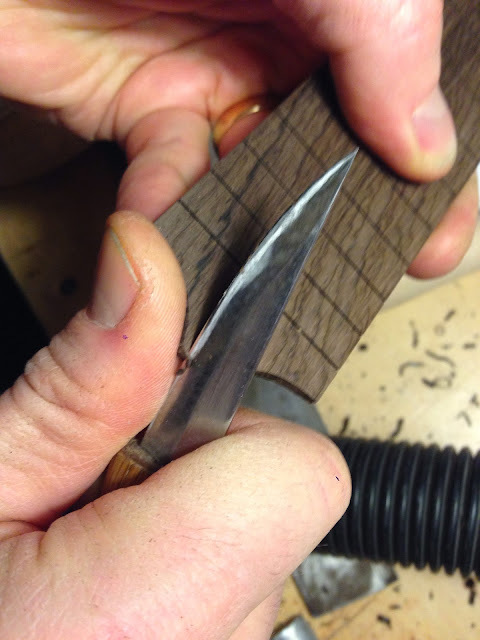 Or maybe an ebony bridge to match the fretboard. Then it's just sanding, scraping and finishing! And a few other steps, of course.